Florida manatee, Trichechus manatus latirostris, a subspecies of the West Indian manatee, endangered. A series of manatees gathering near the warm springs during the bitter cold period of early January 2010. 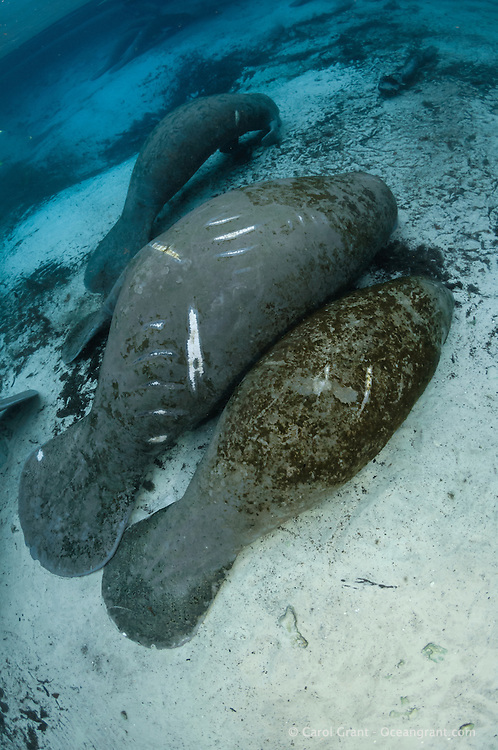 A mother and her calf, both with many boat propeller scar injuries, rest and try to stay warm other manatees around the warm blue freshwater of the springheads. Vertical orientation with blue water. Three Sisters Springs, Crystal River National Wildlife Refuge, Kings Bay, Crystal River, Citrus County, Florida USA.